#1. This week's number one is an experienced former international power forward Meiya Tirera (186-86, currently plays in Spain). She was the major contributor in Valencia's victory against the closely-ranked Gernika (18-8) crushing them 75-49 in the Spanish LFB in Wednesday night's game. Tirera scored 16 points in 30 minutes on the court. Valencia BC (15-10) is placed fifth in the LFB. Tirera has relatively good stats this year: 14.3ppg, 4.0rpg, 1.3apg, 2FGP: 57.0%(179-314), 3FGP: 8.3% and FT: 77.9% in 29 games she played so far. She played for the Mali senior national team two years ago. #2. Second place goes to former international forward Nassira Traore (181-91, currently plays in Portugal). 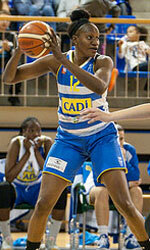 Traore could not help Lombos Quinta (16-6) in their last game on Friday. Despite her very good performance Lombos Quinta was defeated 55-42 at home by the higher-ranked Uniao Sportiva (#3). Traore was the top scorer with 20 points. She also added 7 rebounds. This season Traore has relatively solid stats: 11.5ppg, 5.2rpg, 2FGP: 51.5%, 3FGP: 18.2% and FT: 78.3%. She played for the Mali national team in 2017. #3. The Mali player who performed third best last week abroad was former international center Kankou Coulibaly (185-90, agency: Basket Promotion Agency, currently plays in Portugal) faced previously mentioned Nassira Traore in the Portuguese Liga Feminina last game. Coulibaly led Uniao Sportiva to a victory against the closely-ranked Lombos Quinta (16-6) 55-42. She had a double-double by scoring 11 points and getting 12 rebounds in 35 minutes. Coulibaly has reliable stats this year: 14.5ppg, 9.9rpg, 1.2spg, 2FGP: 49.4%, 3FGP: 19.5% and FT: 74.6% in 25 games. She played for the Mali national team two years ago. #4. Center Djene Diawara (192-85, currently plays in France) managed to help Flammes Carolo Basket Ardennes to win against the closely-ranked Roche (12-10) 81-63 in the French LFB in Wednesday night's game. Diawara recorded only 3 points and grabbed 5 rebounds. Flammes Carolo Basket Ardennes (13-9) is placed fifth in the LFB. Diawara's overall stats this season are: 6.0ppg and 5.7rpg. She used to play for the Mali national team back in 2013. #5. Former international center Astan Dabo (203-92, currently plays in France) was not able to help Nice in their game against Angers (11-3) in the French LF2 (second division). Dabo recorded only 4 points and grabbed 11 rebounds in 32 minutes. Nice lost 59-70 on the road to the leading Angers. The Regular Season already ended. It's Dabo's first season with the team. This year she averages: 6.8ppg, 9.7rpg and 1.9apg in 18 games. Dabo used to play for the Mali national team two years ago. #6. Guard Touty Gandega (170-91, currently plays in France) faced previously mentioned Astan Dabo in the French LF2 last game. Gandega contributed to Angers' victory against the tenth-ranked Nice (7-15) 70-59. She recorded 5 points and added 6 passes. There are only two games left until the end of the Regular Season. So now every game will be critical. Gandega's overall stats this season are: 8.3ppg, 2.0rpg, 4.1apg and 1.5spg. She is a former international player as she played for the Mali senior team two years ago. AS Police improved to an 8-1 record on top beating Stade 61-49. The latter meanwhile fell at 6-3 record on the third place. The second is Djoliba AC with a 7-2 record. They overcame AS Commune VI 82-40. Attar is 5th with a 5-4 record. #1. 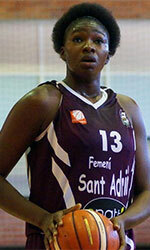 This week's number one is former international center Mariam Coulibaly (193-97, currently plays in Spain). She led Sant Adria to a victory against the league outsider Universitario de Ferrol (3-21) 80-66 in the Spanish LFB in Saturday night's game. Coulibaly had a double-double by scoring 14 points and getting the same number of rebounds in 39 minutes on the court. Snatt's Femeni Sant Adria (17-6) is placed second in the LFB. Her team will play only one more game in the Regular Season. And that game will be critical. Coulibaly has relatively good stats this year: 12.8ppg, 11.1rpg, 2FGP: 51.0%, 3FGP: 9.1% and FT: 71.9% in 24 games she played so far. Former Stade Malien Bamako starter played for the Mali senior national team two years ago. #2. Second place goes to an experienced former international power forward Meiya Tirera (186-86, currently plays in Spain). She contributed to Valencia's victory against the tenth-ranked Maquinaria Ensino (3-22) 57-52 in the Spanish LFB last Saturday. Tirera recorded 8 points. Valencia BC (14-10) is placed fifth in the LFB. Her team will play only one more game in the Regular Season. And now that game is very crucial. This season Tirera has relatively solid stats: 14.9ppg, 4.3rpg, 1.4apg, 2FGP: 58.4%(160-274), 3FGP: 8.3% and FT: 80.6%. She played for the Mali national team in 2017. #3. The Mali player who performed third best last week abroad was former international center Kankou Coulibaly (185-90, agency: Basket Promotion Agency, currently plays in Portugal). Coulibaly contributed to a Uniao Sportiva's victory against the closely-ranked Benfica (22-4) 64-55 in the Portuguese Liga Feminina on Saturday night. She recorded 11 points and grabbed 8 rebounds in 30 minutes. It was the game of the round between two top 4 ranked teams. Clube Uniao Sportiva Ponta Delgada (17-5) is placed third in the Liga Feminina. It was Uniao Sportiva's fourth consecutive victory in a row. Coulibaly has reliable stats this year: 14.8ppg, 9.7rpg, 1.2spg, 2FGP: 49.3%, 3FGP: 22.2% and FT: 75.8% in 23 games. She played for the Mali national team two years ago. #4. Guard Touty Gandega (170-91, currently plays in France) helped Angers win their game against the sixth-ranked Reims (11-9) 72-53 in the French LF2 (second division) in Saturday night's game. Gandega scored 8 points, made 6 passes and 3 steals. Angers - Union Feminine Basket 49 (8-3) is placed second in the LF2. There are only two games left until the end of the Regular Season. So now every game will be important. It's Gandega's first season with the team. This year she averages: 8.3ppg, 1.9rpg, 4.1apg and 1.5spg. Gandega has a dual citizenship: Mali and French. Despite she played previously for the French U20 national team, Gandega is currently in the Mali national team roster. #5. Former international center Djene Diawara (192-85, currently plays in France) managed to help Flammes Carolo Basket Ardennes in a victory against the league outsider Mondeville (2-19) crushing them 70-44 in the French LFB last Sunday. She scored only 2 points and grabbed 5 rebounds in 10 minutes. Flammes Carolo Basket Ardennes (13-8) is placed fourth in the LFB. Diawara's team will play only one more game in the Regular Season. And now that game is quite important. This year Diawara's overall stats are: 6.1ppg and 5.8rpg in 21 games. She used to play for the Mali national team six years ago. #6. Forward Nassira Traore (181-91, currently plays in Portugal) helped Lombos Quinta win their game against the closely-ranked Vitoria SC (10-16) 72-65 in the Portuguese Liga Feminina on Saturday night. Traore recorded 11 points, 3 assists and 5 steals. Quinta dos Lombos (16-6) is placed fifth in the Liga Feminina. Traore's stats this season are: 10.5ppg, 5.3rpg and 1.1spg. She is a former international player as she played for the Mali senior team two years ago. #7. Former international center Minata Keita (190-89, currently plays in Spain) is a teammate of previously mentioned Mariam Coulibaly and both played together in the last Spanish LFB game. Keita helped Sant Adria win their game against the league outsider Universitario de Ferrol (3-21) 80-66. She recorded only 4 points in 15 minutes. This year Keita's total stats are: 4.9ppg, 4.7rpg and 1.4spg in 25 games. She used to play for the Mali national team two years ago. #8. Center Astan Dabo (203-92, currently plays in France). Dabo could not help one of league's weakest teams Nice (6-14) to beat COB Calais (7-13). She cannot count Saturday's game as one of the best ones. Dabo scored only 2 points and grabbed 7 rebounds. Nice was crushed 78-39 on the road by the higher-ranked COB Calais (#9). It was Nice's third consecutive loss in a row. There are only two games left until the end of the Regular Season. Dabo has averaged so far 6.8ppg, 9.7rpg and 1.9apg. She used to play for the Mali national team back in 2017.